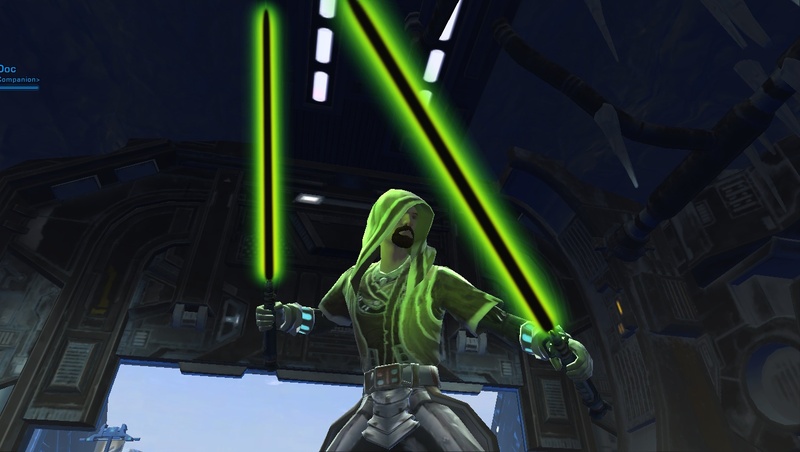 Jedi Crusader (2/2) – Grants 1 focus for each time Rebuke damages an attacker. This is useful with any AoE damage, to help increase resource management. 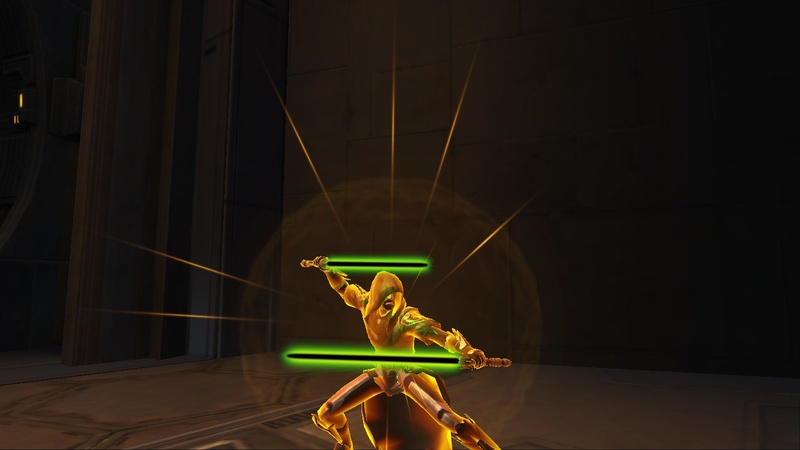 Dual Wield Mastery (3/3) – This is a strong ability for any Sentinel build in my opinion. It increases damage done by off-hand lightsaber by 36% when fully spent. Defensive Forms (2/2) – This is another important ability for any build in my opinion, simply because it enhances every stance. It also increases Centering when attacked, which can happen with AoE damage. This also increases movement speed while in Ataru by 15%, which can be handy for moving in and out of AoE damage zones. Steadfast (3/3) – Increases melee and Force accuracy by 3%. Great for long, sustained fights. Defensive Roll (2/2) – This is a useful ability that decreases the amount of AoE damage you take by 15% when one point is spent, 30% with two points. Getting a flat reduction of all AoE damage by 30% is kind of worth it considering how many skills are AoE that are used by bosses. Since we often find ourselves in the thick of things, this could be useful for that reason. Opportune Attack (2/2) – Ataru Form hits have 100% chance to make next Focus-spender attacks do 10% more damage. More damage = win in PvE. Ataru Form (1/1) – This is the form you are going to want to use with this tree. This gives bonuses to accuracy, but more importantly, triggers extra attacks 20% of the time, plus increases movement speed thanks to Defensive Forms. When you activate Zen while in Ataru, it reduces the Focus cost of Slash and Blade Rush by 1, and it reduces their global cooldown by 0.5 seconds. Speed is the name of the game with Ataru. Ataru Mastery (2/2) – Increases damage done by Ataru triggered attacks by 30%. Makes a good thing better. Combat Trance (1/1) – Ataru Form triggered hits activate Combat Trance for 6 seconds. When it ends, it gives 1 Focus. A nice bonus, and essential for other procs in this tree that depend on Combat Trance. Immaculate Force (2/2) – Increases crit chance of Blade Storm by 100% when Combat Trance is active. Yay for crit, and on a really powerful, semi-ranged skill. Righteous Zeal (2/2) – Zealous Strike is one of our most important skills, as it instantly gives us 6 focus. Having this on a lower cooldown, like this ability does for us, is a good thing. Fleetfooted (2/2) – This is primarily useful to increase the movement speed buff of Transcendence by 30%, which is a lot, considering this speed buff applies to the whole group. Precision Slash (1/1) – grants a decently large attack, which gives the Precision buff. Precision lasts for 6 seconds and gives us 100% armor penetration. Swift Blades (2/2) – Reduces cooldown and focus cost of Blade Storm by 3 seconds and 2 pips, respectively. Debilitation (1/2) – Gives a 50% chance to immobilize an enemy for duration of Master Strike. Master Strike is also further buffed by Master Focus from the Focus tree. This is mainly because I had an extra point with nothing to put it in that had a significant impact. It is nice to use Master Strike on trash and not have them move away, but it isn’t really that important. Replace at will, in my opinion. Saber Storm (3/3) – Increases critical strike damage of Blade Storm, Blade Rush, and Ataru Form by 30%. This is just a great overall damage boost that will help some of your primary skills. Blade Rush (1/1) – Grants an attack that produces an automatic Ataru Form strike, as well as increasing the chances for Ataru strikes for the next 6 seconds by 30%. Valor (2/2) – Increases Centering built by using Focus-spending attacks by 2. Also reduces the cooldown of Valorous Call by 30 seconds. I love this talent so much, because I love popping Transcendence on demand, especially with the buffs in this build for Transcendence. Focused Slash (3/3) – Slash, Dispatch, Blade Rush, and Merciless Slash refund 1 focus when used. This is just a great way to keep on fighting when using important skills. Master Focus (2/2) – Reduces the cooldown on Master Strike by 3 seconds, and increases its damage by 8%. Be sure to check out the Sentinel/Marauder Advanced Class guide! heating repair used to replace the real ones that have either been broken, damaged or have decayed irreparably. with regard to the bite as well as detachable cosmetic braces.